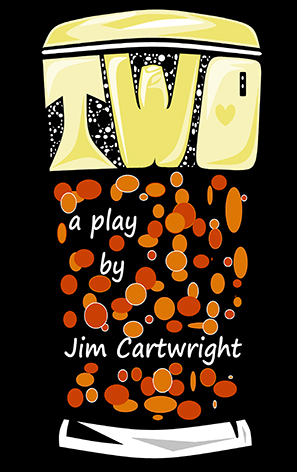 Set in a northern UK town Jim Cartwright’s Two features Michelle LeBlanc and Richard Gelinas in not only the roles of husband and wife publicans, but also as the dozen or so characters that pop in for a drink over the course of an evening down the pub. This inventive two-hander opens with the landlord and lady deftly serving imaginary customers whilst biting and snapping vicious asides – the play slowly reveals clues to this brewing storm. Laughingly they pull pints as she rolls her eyes and snarls at his tired banter while he berates her for wasting profits by sitting a drink to a regular. They’ve no social life and no family life as all is “pulled” from behind the bar. Via swift changes Leblanc and Gelinas take the audience through a cast of characters rich in human emotion as they paint a vivid picture of a community populated by lively and varied regulars. For anyone who has lived in the UK, Cartwright’s writing is bang on as are the portrayals of the very real and penetrative stories that lie behind the everyman down the local. While certain moments may teeter on the verge of saccharin or melodrama, the stories seem penned from real lives and this keeps the narrative solid. Two invites its audience, some literally on stage, to inhabit the pub as an old dear, “regular as clockwork,” enters stage left. She takes her quiet Guinness and shares that the booming laughter of the butcher down the shops and her drink are the small daily respites from the onerous burden of being the sole aging carer for her ailing husband. The beating heart of her reality lingers as she finishes up and slowly shuffles off. The characters come and go, some successful and others less so. The lecherous Moth and girlfriend Maudie seem a tired effort; caricature rather than character. While the couple that come to watch the telly and eat packets of crisps prompted spontaneous pleasure and mid-act applause. LeBlanc is more consistent with greater endurance in maintaining the marathon demands of these performances. The accents are at times slippery as eels with some clearly antipodean moments but there are a few good “loves” that wouldn’t be out of place in Sheffield. In the whole LeBlanc & Gelinas do not disappoint as they populate this pub with the bereft, the angry, the cowed and the hopeful. When the root of the disharmony between the pub owners is revealed, it’s a sobering coffee at the end of a long night leaving a sharp taste that concludes the evening with the sense of a journey still to be taken. Finally it’s the collective of portraits that lingers gently, emphasised by Cartwright’s landlord and lady remaining nameless to the end. And that’s the success of this production, some sketches outshine others but it’s the collective that makes it work. Everyday lives publicly moving forward while challenges are privately waged within. These ordinary, even common, lives will undoubtedly leave some uncomfortable and others cold –but to people watchers, voyeurs and those that enjoy social commentary, these curious characters and John P. Kelly’s subtle direction will sing.